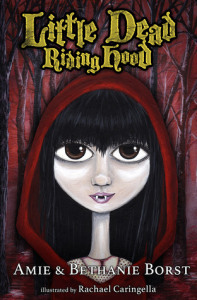 Erik over at This Kids Reviews Books posted a fantastic review on the fractured fairy tale Little Dead Riding Hood by Amie and Bethanie Borst. It’s October and time for some monstrously fun books! Here is one that is released today! Hehe Scarlet Small sounds like a fun character! She does. I love reading fractured fairy-tales. This sounds like a fun read, thanks for sharing, Michelle! If you haven’t checked out Erik’s blog, I highly recommend that you do. He does terrific reviews. I know. I am tempted to go pick it up.